Dice Rally Co-Op offers items at 30% off list, ordered when sales reach minimum order quantities! We are attempting to earn a FedEx Small Business Grant! Click the link, vote, help us out! 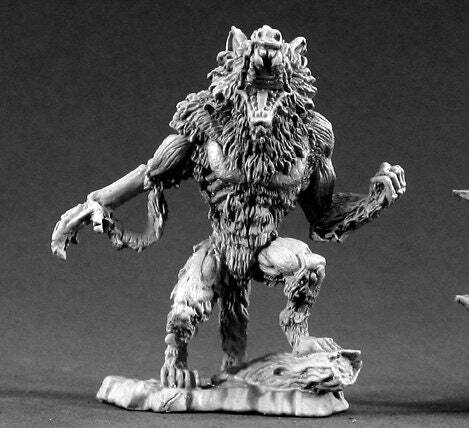 This miniature manufactured by Reaper Miniatures is ready for painting and perfect for inclusion in your next Dungeons and Dragons or other tabletop roleplaying game. Additional lead time required to ship this item. We accept PayPal and all major credit cards via Etsy Payments. Cancellation is available any time within 7 days of order in most cases. We ship using Etsy calculated shipping for most physical items, which ensures that multiple items can be readily combined without problems. We tend to ship at least twice per business week, or more often during high order volume periods. We have set shipping time for one to two weeks for most orders due to medical reasons; we will do our best to ship things in a more timely manner but apologize in advance for difficulties and delays. Items marked as 'needs additional lead time' require shipment from the manufacturer and thus carry additional lead time. Items marked as 'backorder' are delayed at a manufacturer level due to supply; we will ship as soon as they become available but cannot guarantee a specific ship date. Items shipped internationally have limited tracking capability. Please make absolutely certain that you provide accurate shipping information. We are unable to provide refunds for items that are confirmed to have reached the destination country. Items that are marked as 'Additional lead time required' are not stock items, and are purchased from our manufacturers and brought in to be shipped with the rest of your order. In some cases, we may be unable to provide an item immediately due to a stock outage at the manufacturer level; if this is the case we will do our best to notify you as soon as we are made aware of the issue and will offer refund, replacement, or back-ordering as relevant. No refunds will be made on digital downloads. You will receive a download notification email from Etsy, separate from any transaction notification emails you may receive from Etsy or Paypal. Once you have paid for digital download access, you can use the Instant Download option on a listing to redownload it, or go to Purchases and Reviews and click the Download Files option next to your order. Please note that the Etsy app is not compatible with digital downloads at this time; sign in via your mobile browser or computer to download these purchases. For custom orders, preview picture(s) of the order will be shown to you so you can decide if it is indeed what you wanted. Once you approve the preview and purchase the item, no refund will be issued except in cases of damage or loss. You may cancel an order within 7 days of purchase if it has not already been shipped, and receive a full refund on your purchase. Cancellations beyond this point may be accepted but are not guaranteed. Please contact us with pictures of the item's current condition and the condition of packaging. Refunds will not be processed without this information. If item is shipped insured, we will ask that you either claim the postal insurance or allow us to claim the insurance on your behalf. Damaged items not insured by the customer will be made good to the best of our ability, but are not guaranteed. Vintage items are sold 'as is' with no refunds except in case of loss - but every effort will be made to accurately document and describe the item's current condition. Wondering where Lab Arc Designs (the name) comes from? The initials of my maiden name (LAB) and my husband's name (ARC) have been used for our various ventures since we got together in 1997! Roll 4 It Dice is our growing business for dice, miniatures, and other fandom and fun items, and has been appearing at conventions since 2015. Our Dice Rally Purchasing Cooperative offers dice (and other items) in a quantity equal to the minimum order quantity required for the item. When sales reach that minimum quantity, we order the item from the manufacturer/distributor, and it ships out to customers once we receive it. This allows us to offer massive discounts to our fellow gamers, without having to maintain massive stocks of unsold inventory due to order requirements. Dice Rally Winners: These items have met minimum order requirements! Items remain at Wniner level and remain orderable until we can put through an order; delays are typically due to manufacturer out-of-stocks. Dice Rally Leaders: These items have received attention and are on their way to becoming winners! The quantity remaining in the drop-down is the number of items that must sell to reach Winner status. Dice Rally Runners-Up: These plucky underdogs haven't received an order yet. Minimum order quantities vary from 3 to 20 in most cases depending on the item and manufacturer. For manufacturers with a minimum purchase quantity (must order $50, etc) rather than a minimum item quantity (must order 20 of this item), we may elect to mature items from the same manufacturer when we place an order with them next, even if they haven't reached the Winner point. This means that if, for example, WizDice Dragonberry has 3 sets sold out of 12, but we are making an order with WizDice anyhow, we may well get Dragonberry ordered and shipped at the same time because we have already surpassed minimum requirements through other items ordered.